This month Suitable Technologies, manufacturer of the Beam telepresence robot systems has unveiled its next generation telepresence robot in the form of the BeamPro 2, which now comes equipped with two “super-wide” 12-megapixel HD cameras enhanced with 12x digital zoom. Together with a large 24 inch touchscreen display and included 3D depth sensors which were an optional extra on the original Beam robot. To further improve ergonomics and positioning while engaging in a videoconference, the screen of the BeamPro 2 can be moved 10 inches in a vertical direction and the motion-controlled robot is equipped with obstacle detection sensors that allow the robots six wheels to rotate and move around objects that may hinder its movement. Designed for crowded spaces such as hospitals, special care facilities, manufacturing floors, classrooms and museums the telepresence robot offers a way to engage in videoconference calls using a self-contained easily positioned robotic platform, that can be controlled by either local or remote participants. The BeamPro 2 is expected to officially launch sometime during the summer months of 2018, although no details on pricing or worldwide availability have been announced as yet. 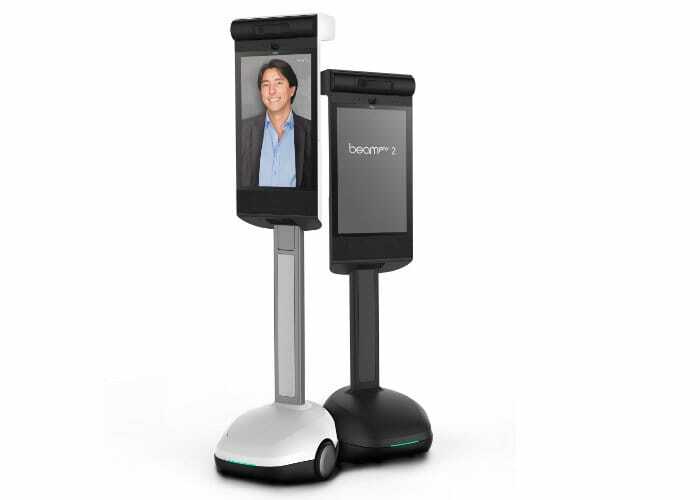 To recap the original BeamPro telepresence robot cost an eye watering $13,950 and required an additional $400 annual subscription to function. Let’s hope Suitable Technologies have been able to utilise available technologies to make the price of the BeamPro 2 more competitive.